Posted by Jeff Kauppila on Wednesday, March 21, 2012 in News, Related News. 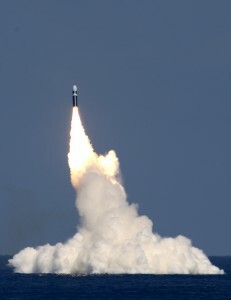 Trident II D5 missile being launched is the primary weapon carried by the US Navy's Ohio-class submarines. Photo: Lockheed Martin. The US Navy’s fleet ballistic missile submarine, USS Tennessee (SSBN 734), has successfully launched the Lockheed Martin-developed Trident II D5 test missile in the Atlantic Ocean. The unarmed missile was launched as a single mission test and part of demonstration and shakedown operation 23 (DASO-23) to certify USS Tennessee for deployment, following an overhaul period. The Navy used a missile kit containing a wide range of range safety devices and flight telemetry instrumentation to convert the missile into test configuration. The D5 Life Extension Programme was initiated by the Navy in 2002 to ensure high-level readiness and safety of nuclear deterrence capability of the submarine by replacing ageing components of the Trident II missile. The Trident II D5 is a sophisticated three-stage, solid-propellant, inertial guided missile capable of carrying a heavy payload and is accurate enough to serve as a first strike, counterforce or second strike weapon. The ballistic missile can travel a nominal range of 4,000nm while carrying multiple independently targeted re-entry vehicles. The weapon is a submarine-launched ballistic missile (SLBM) with multiple independently targetable re-entry vehicle (MIRV) capability and is the primary weapon carried by the US Navy’s Ohio-class submarines. The US Navy’s Ohio-class fleet of ballistic missile submarines (SSBNs) are conventionally armed, nuclear-powered and virtually undetectable undersea launch platforms for intercontinental missiles. The recent Trident II D5 missile test flight marked the 137th successful flight by the US Navy since 1989. Since the inception of the Fleet Ballistic Missile program more than 50 years ago, Lockheed Martin Space Systems has been the strategic missile prime contractor for the US Navy Strategic Systems Programs. The D5 missile is also currently aboard the UK Royal Navy’s Vanguard-class submarines. Additionally, the US Navy has released a YouTube video of the February 22nd launch.